We love our cuddly bear making parties and offer our create-a-bear activities in addition to our existing packages. This means that the birthday child can have the best parts of all our parties rolled together in to an amazing party for their special day! For example bear making can be done in addition to a Princess party or as a add on to a pamper party. Many parents use the bears as a substitute for a party bags and are a great gift for all the guests to take home and remember the party for a long time to come! Our no-sew kits are simple and fun to make. The bears come with their own make-a-wish star to bring them to life, birth certificate and bag. 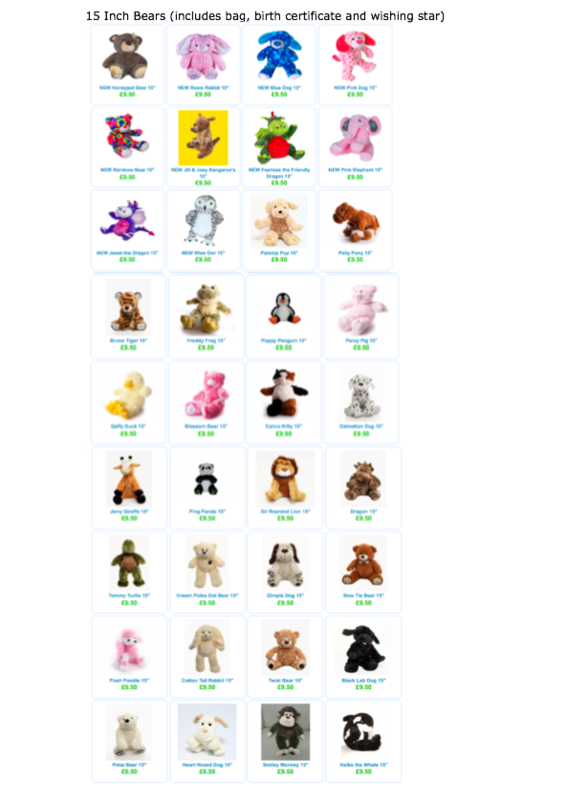 We have roughly 15 different designs - everything from cuddly bears to golden unicorns! There is something to suit every individual taste. Although our bear making parties are most popular with girls, boys love our bears, leopards, lions and tigers! The host is present at your party for 2 hours, though more time can be booked in advance if you require. Costs for this package depend on the bears made. The initial party packages, as detailed on our theme parties page, are £12 per head and our bears are an add on. These bears are offered at a reduce rate if taken with a Make Believe Party Package, however we have now started adding bear making party kits to buy without taking our packages for those who want to host their own party but with our fantastic bears as an activity. 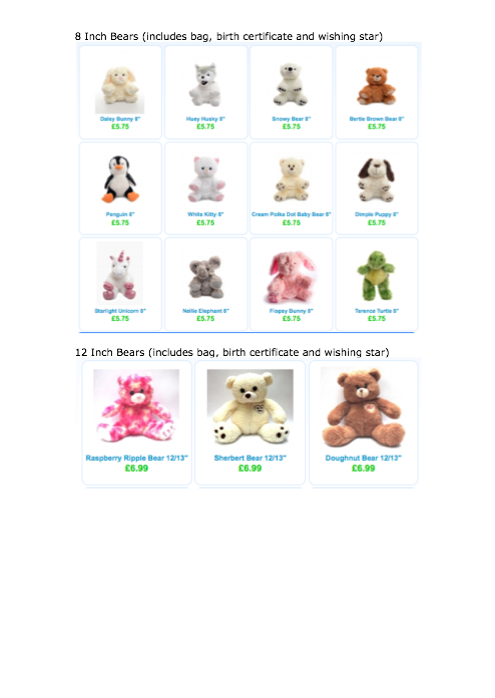 There are a variety of amazing bears to choose from including rabbits, unicorns, tigers, traditional bears and new designs arrive throughout the year! A bear T-shirt decorating activity is also available at an additional cost of £1.90 per head.